This was posted the day before 9/11. This morning I read on another message board where some individual is claiming that there is a doctrine in the Dhamma that permits killing in self defense and in the case (such as with a Hitler) where numerous beings would be saved suffering and death as a consequence. This is absolutely not Dhamma. There is no doctrine in the suttas which advocates intentionally killing any living being (including one's self) under any circumstances. There is no doctrine in the suttas which would even support activism in a worldly situation, self-defense, protest or politics of any kind. This may be taken literally: that is, in the situation where an individual is in danger of serious injury or death and another injury (such as surgery, or drawing another's blood for a transfusion) (if the individual to be injured is willing, or if the individual is incapable of indicating willingness, if there is a competent guardian who acts on that individual's behalf for that individuals benefit) will save that individual, then such an act is appropriate. How come? Because all parties to the situation have the intent to do good and no intent to do bad to anyone. That's how come. This may be taken figuratively: that is, where there are beings who are going astray because of wrong views, who will suffer grief for their views if the truth is told, then the truth may be told when the intention is to save these individuals from the suffering their views may bring upon themselves. How come? Because the intent of the one causing the pain is to assist in eliminating the pain of the one's he is injuring, and the pain of those being hurt is the pain of one suffering withdrawal from a bad habit...that is, it is a good thing that is happening, and the view that it is a bad thing that is happening is incorrect. "The Teacher does not contradict the world, Beggars, it is the world that contradicts The Teacher." Even here there is need for caution: if one understands that one's efforts will fail one must not make the effort for to do so would put the others in the position of disbelieving the Truth and as such it would be to intentionally cause others to do themselves injury. There is nothing in this which indicates that one may intentionally cause pain, injury or death to one (unwilling, uncooperative) individual (even a Hitler) to alleviate the pain of another individual or individuals, or, for that matter the entirety of humanity. Such a view ignores completely the law of kamma: individuals are responsible for their own actions; beings suffer the consequences of their own actions; intentional wrong acts are a bad example to others and are therefore bad kamma on two levels. 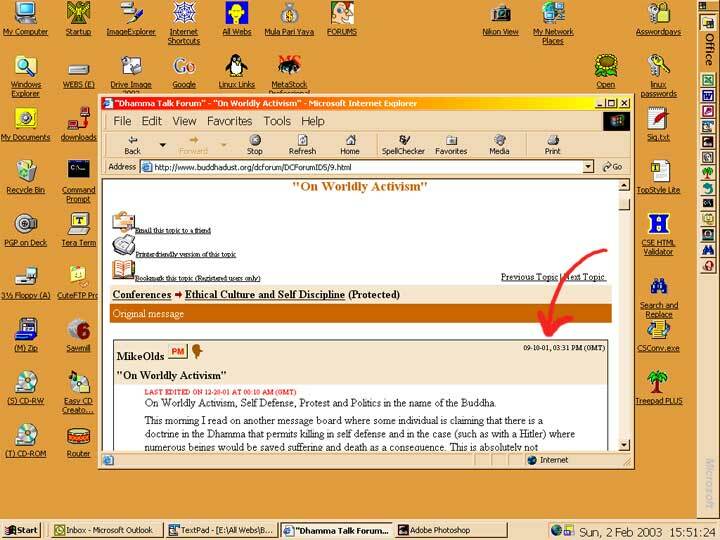 In this day an age (September 10, 2001) we have seen Bhikkhus claiming to be followers of Gotama set themselves on fire to protest the political points of view of others; we can see daily the political activism of leaders of Buddhist schools; and there are in existence numerous groups of Buddhists whose orientation is the defense of or advocacy of clearly worldly concerns. Whatever the good intentions of these individuals, where they go astray is in suggesting that their personal position is justified by the teachings of Gotama. Straight out, self immolation (or any sort of self mutilation even the "hunger strike" made in protest) is an extreme act of anger. If it results in death, it amounts to murder. It is a bad example to others. It rouses others to extremes of anger. It completely lacks compassion for the enemy. And it propagates a wrong view claiming it to be the Dhamma. This Dhamma is for those who see the suffering inherent in living in the world and understand that there is no stopping this suffering by altering things in the world. Those leaders of groups of Buddhists who engage in Politics and Activism on behalf of worldly issues are leading their followers away from the Dhamma, setting a bad example, rousing others to anger, and display anger towards others. There was a case where a certain king went out with his army to slaughter Gotama's clan for an insult he had received at the hands of Mahanama, the Sakkyan Prince whose daughter by a slavegirl was given to King Pasanadi. Gotama, seeing the outcome for one and all, and out of compassion for one and all, decided to take action in the effort to prevent the slaughter. What was his action? He sat by the side of the road on which this king would go to do his deed. This worked three times, and failed the fourt time. On the fourth time the Buddha realized there was going to be no stopping him by reminding him of his better nature, and he let it drop at that point. An act of protest? No. An act where the good of all concerned was considered and where no injurious act was committed towards any involved party. Activism yes, but in the service of the Dhamma, and by methods worthy as examples of Dhamma, not in the service of worldly gains. We have the simile of the saw: where it is said that even if bad guys saw one to pieces if one allows anger to result, one is not following the Buddha's instruction. We have the case in the BrahmaGala Sutta, the first sutta of the Long Discourses, where the Buddha speaks of how the Beggars should react to criticism of the Buddha himself (not to speak of reacting to those in the world who criticize one another! ): here he states that it would not be proper to react with anger because that would obscure one's ability to understand the situation clearly and respond appropriately. And what would be appropriate response? To take the issues one at a time and deal with them on the level of the issues, not on the level of the emotions. We have the case of a beggar who was very attached to the female beggars. He would get angry at anyone who even slightly criticized them. He was reprimanded for such and told that even if others physically assaulted the female beggars, if he were to indulge in anger or acts of anger as a consequence he would not be doing the Buddha's bidding. I am dealing with this issue here to protect those who find refuge here. I am not going there to do battle with those there. This is not me contradicting those who hold other views; this is me indicating where those of other views are misrepresenting the Buddha (those of other views are free to protest or do whatever acts they believe are appropriate...what I am free to do is to state "just this and that is not found in This Dhamma...and that is what I am doing). On the one hand it is good to see people seeking in the dhamma for answers; on the other hand I see that the bulk of the effort is being directed towards the attempt to figure out which Buddhist authority should be relied upon for one's position in the matter. I think a more productive outcome would be to consider the situation from the point of view of the dhamma itself for even by the Buddha's own instruction we are not to simply go by the word of some authority, even that of the Buddha. So what is the dhamma that applies here? Do we need to go farther than the most fundamental instructions: This is a system which tells us that when we can see for ourselves that going a certain direction is the source of bad conditions increasing and good conditions decreasing, that we should stop going that direction. So let me ask you: Can you see for yourself that Lust, Anger, and Blindness are bad conditions; that actions based on Lust, Anger, and Blindness are painful in result? Is retalliation against one's enemies an act that originates in Lust or does it originate free from Lust? Is retalliation against one's enemies an act that originates in Anger or does it originate free from Anger? Is retalliation against one's enemies an act that originates in Blindness or does it originate free from Blindness? The recent terrorist action has pushed some very hot buttons. I think it is a very understandable thing to see many people reacting with desire to cause pain in those who caused them pain, with anger in their hearts and with little or no understanding of anything other than the pain that they have experienced. If you are truly interested in your own mental welfare, however, I strongly suggest that you make an attempt to create a divide between what the Dhamma teaches us and your own capabilities to act in strict accordance with this dhamma. This dhamma is unequivocal: act from lust, anger, or blindness and the consequences bring pain. There is absolutely no justification in the Dhamma for any sort of intentional infliction of pain on anyone, even one's worst enemies. If you need the authority of the Dhamma, look to MN 21: The Simile of the Saw: where the instruction is that even if bad men are sawing one to pieces if one adopts a heart of anger as a consequence one is not doing the Buddha's work. Draw a divide and you will, at a later time, when you head has cooled off, be able to say: "I was wrong here, I was weak in wisdom, this is a good system to which I will return now." Try and justify by referencing the Dhamma your own weaknesses and inability to control your emotions and in the end you will have no Dhamma to return to. The main thing that [is being missed by the poster who advocates retaliation] is that the idea is not what we want to do, feel like we want to do, or what others tell us to do, but what is the ideal we should aspire to if we are to call ourselves followers of the Buddha's Dhamma. "Many Buddhists argue that war is avoidable and never acceptable, but some insist that it is justified under certain circumstances. The Buddha has pointed out that death was the destiny of warriors even after initial victories. But he did not appear to intervene in 'just' wars, e.g., for self-defense. Accordingly, Buddhists when under attack, often argued that violence and war were permissible under those situations to save their life and property and to protect their way of life and the Buddha's Teachings." It does not matter to the case what the Buddha did not do. To think one knows the implications of an inaction is a presumption, and that is a particularly dangerous thing to do when dealing with a mind such as the Buddha's. In any case, intervening in worldly matters is not remotely connected to the purpose of the Dhamma. The system is based on not-doing; letting go, and escaping the world. If "doing" were a requirement of the system there would be no way for individuals to escape kamma. We, as students of the Buddha, should look to his actions, and to his words. Nothing in any of the actions or words described in the Suttas would indicate even the slightest hint of any tolerance for any act of body, speech, or mind done with the intent to injure. If you disagree with this I ask you to point to any line in the suttas where there is any positive statement concerning acting with intention to injure. It does not matter what "Buddhists" say; or that others have said that Buddhism is this or that. Our job is to understand Dhamma by way of Dhamma not the talk of others, whether Buddhists or non-Buddhists, whether in positions of authority or not. We should rely on the word of others (whether Buddhists...etc) only insofar as their words are consistent with Dhamma. "... in another Sutta from Digha Nikaya. ... The Cakkavatti Sihanada Sutta described the story of King Dalhanemi, a Universal Monarch. The Buddha recounted the story of this king who ... in a righteous manner, arrange to provide protection, shelter and security for all your [sic] citizens including soldiers, samanas and brahmanas." With regard to the example of the Wheel Turning King; it was not The Buddha who advised this king, it was the Bhodisattva in a previous birth, before his enlightenment, and that makes all the difference. The Jakata stories (and that is what this sutta really is) are filled with examples of the Bhodisattva preaching values inconsistent with the Dhamma. These should be read for just what they are: stories of the various values held by people and the Buddha prior to the Buddha's enlightenment. And, what it is proper for a king to do in the proper performance of his duties is in no way something that should be taken to indicate that it is, in terms of Dhamma, good, or proper or will lead the doer thereof to anything but the appropriate kammic result. "Self-illuminated, Beggars, live self-protected, by not else protected; dhamma-illuminated, dhamma-protected, by not else protected." There are two things badly done in this essay: first of all, although there are statements to the effect that the Cannon justifies violence under certain circumstances, the suttas are cited only once, and that simply to indicate a description of one lay follower's situation. The rest of the citations are to commentary. Now there will be many who disagree with this, but our instructions as followers of Buddha are not to take the word of commentators where they differ from the meaning of the suttas, and that is just what is being suggested by this writer. The second mistake he makes, and one which you appear to be making as well is to identify Buddhism with the behavior of those who call themselves Buddhists. Even in the Buddha's day, some of his followers were violent men and people who taught wrong dhamma. Buddhism is the Dhamma as exemplified by the Buddha, the Suttas, and the Eight Pairs of Men (Streamwinner through Arahant), not by the "uneducated many folk." "If their country is invaded, all lay citizens, except very young, old, or infirm, are duty-bound to defend in an appropriate way, if there are no other options. 'Doing nothing' or 'Surrender' is not an option unless we are all Arahants. We have read stories of many men becoming Monks just to avoid those army duties in times of crisis. The Buddha even had to introduce new rules to prevent army deserters." The question here is by whose definition of "duty" is the layman bound? You have not made the case that the Buddhist layman is in any way bound to self defense or violence or even protest by any evidence based on the Actions or words of the Buddha. You suggest that because a rule was made to prevent deserters from joining the Sangha, that the implied weakness of individuals endorses armies and war and violence. I suggest that the making of such a rule does no more than the rule that requires that one have no obligations or debts before joining and those rules do not condone obligations or debts. You say: "At the moment Buddhists are not directly involved. Buddhism teaches the doctrine of Peace and Liberation. But it is not the doctrine of Surrender." In one way it is proper to say that Buddhism is not the doctrine of surrender: that is, surrender to bad conditions such as Lust, Anger, and Blindness; but that is not, I believe, what you had in mind. Letting Go is the First Principle of Samma Sankappa. "In this teaching, monks, a monk, wisely reflective, develops mindfulness as a link in awakening and which is dependent on aloofness, dependent on lack of attraction, dependent on ceasing, ending in renunciation." "In this teaching, monks, a monk, does not give in to malevolent thought...thought of harming that has arisen, he gets rid of it, he eliminates it, he makes an end of it, sends it to its ceasing." "In this teaching, monks, a monk, wisely reflective, is one who bears cold, heat, hunger, thirst, the touch of gadfly, mosquito, wind and sun, creeping things, ways of speech that are irksome, unwelcome; he is of a character to bear bodily feelings which, arising, are painful, acute, sharp, shooting, disagreeable, miserable, deadly." "Here a Bhikkhu, reflecting wisely, develops the mindfulness enlightenment factor, which is supported by seclusion, dispassion, and cessation, and ripens in relinquishment. And of what sort is the effort to make become? Herein a monk makes to become the limb of wisdom that is mindfulness, that is based on seclusion, on dispassion, on ending, that ends in self-surrender. He makes to become the limb of wisdom that is investigation of Dhamma ... the limb of wisdom that is energy, that is so based. He make to become the limb of wisdom that is zest ... that is tranquillity ... that is concentration ... that is equanimity, based on seclusion, on dispassion, on ending, that ends in self surrender. This, monks, is called "the effort to make become." Image of an empty seat - the early manner of dipicting the Buddha in images. No image courtesy of the British Museum. You'll have to make do with my drawing of it. Whatever 'iconic' may mean, it is likely the Buddha would have objected also to such representations as footprints. Buddhas and Arahants are called 'trackless', and the aim is 'signlessness'. WASHINGTON - New efforts are under way in Afghanistan to preserve the little that remains of two ancient Buddhas destroyed last year by the Taleban. These are the Afghanastani Buddha statues that the Talaban blew up recently. This is what I say: Let it go! This is just rock, pathavi, earth. "There comes a time when this old earth becomes disturbed." It's in the nature of things that have been constructed that they come to an end. To this point about a million dollars has been put together to help in the restoration of these statues. They are speaking about raising $35 million. $35 million would feed the entire population of Zimbabwe for more than a year and they want to spend that on restoring the contrived shape of some rocks that I have no doubt whatsoever the Buddha himself would have had destroyed had they been constructed by his sangha. We as Buddhists would be better off ourselves, and be showing the world a true face of Buddhism if we were to make it known that it is our belief that the real lesson here is that all things come to an end, and that rather than wasting money fighting this true fact, we direct it at the relief of another true fact: people, living beings here, are going without food, clothing, medicine, and shelter which this money could be used to supply. There! Was that being an activist? Yes. I am saying "Just this and this are not found in this Dhamma. Just this and this are not done by one acting according to this Dhamma." There is an exception, of course, although it is not a very broad one (and it is not really an exception to the idea that this is not a thing which is recommended or even explicitly allowed in the suttas; it is just a statement of the outcome in terms of kamma and ethics): in the case of an individual who is suffering grievous physical pain, who is also able to reach Arahantship at the moment of death, there is no bad kamma or "blame" for that individual if he brings his own life to an end violently (as with a knife). One who commits suicide and fails the attainment of Arahantship at the time of death will have committed an act of murder and will experience the kammic consequences of that act. I have the characters in this wrong (or I am remembering it from another instance), but for the same idea see: [mn.058]...a few paragraphs down. "The second visit of note [by the Buddha, to Kapilavatthu] was that paid by the Buddha when Vidudabha chagrined by the insult of the Sakyas, invaded Kapilavatthu in order to take his revenge. Three times Vidudabha came with his forces, and three times he found the Buddha seated on the outskirts of Kapilavatthu, under a tree which gave him scarcely any shade; near by was a shady banyan-tree, in Vidudabha's realm; on being invited by Vidudabha to partake of its shade, the Buddha replied, "Let be, O king; the shade of my kindred keeps me cool." Thus three times Vidudabha had to retire, his purpose unaccomplished; but the fourth time the Buddha seeing the fate of the Sakyans, did not interfere. [MN 21] Middle Length Sayings, I, #21 The Simile of the Saw, Bhk. Thanissaro translation.